Combine sweet potatoes, Chipotle olive oil, orange blossom Sicilian honey, and cinnamon in medium bowl. Toss to coat well. Spread in single layer onto sheet tray brushed with additional olive oil. Season with freshly ground sea salt and black pepper. 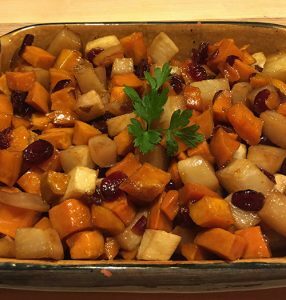 Roast, uncovered, at 375 degrees, until sweet potatoes are well-glazed, browned around the edges, and tender but firm, approximately 45-50 minutes, stirring halfway through cooking. Enjoy! These Vitamin A- and C-packed sweet potatoes make an unexpectedly delicious, creamy and satisfying addition to our Cape Crush Smoothie.